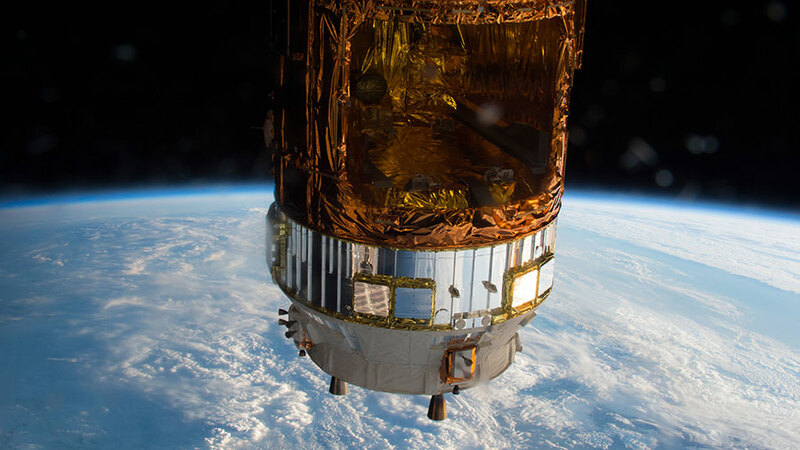 Japan’s H-II Transfer Vehicle is seen with the Earth behind it. In a remarkable demonstration of robotic prowess, ground controllers used the Canadian-built “Dextre” Special Purpose Dexterous Manipulator over the weekend to install three new lithium-ion batteries in the International Space Station’s 3A power channel Integrated Electronics Assembly (IEA) pallet on the starboard 4 truss. Dextre also removed four old nickel-hydrogen batteries from the IEA, three of which were stowed on the Japanese H-II Transfer Vehicle’s external pallet to wrap up the first act of a complex procedure to upgrade the station’s power system. A fourth old battery was temporarily stowed on a platform on Dextre. This clears the way for the first of two spacewalks Friday in which Expedition 50 Commander Shane Kimbrough and Flight Engineer Peggy Whitson of NASA will install three adapter plates in slots on the IEA to which three of the old nickel-hydrogen batteries will be mounted to remain on the ISS but will be dormant. In all, nine nickel-hydrogen batteries will be stowed on the external pallet for disposal when the HTV is deorbited to burn up in the Earth’s atmosphere late this month. Three additional new lithium-ion batteries flown to the ISS aboard the HTV will be robotically installed in the starboard truss’ 1A power channel Integrated Electronics Assembly between Friday’s spacewalk and a second spacewalk scheduled Jan. 13 for Kimbrough and Flight Engineer Thomas Pesquet of the European Space Agency. Five additional nickel-hydrogen batteries will be removed robotically from the IEA prior to the second spacewalk. A briefing to preview the two spacewalks and to review all of the robotics work will be broadcast on NASA Television on Wednesday, Jan. 4 at 2 p.m. Eastern time. The LM-built radiators (PVR) are still functional, keeping the batteries cool? Or will they need replacing also?